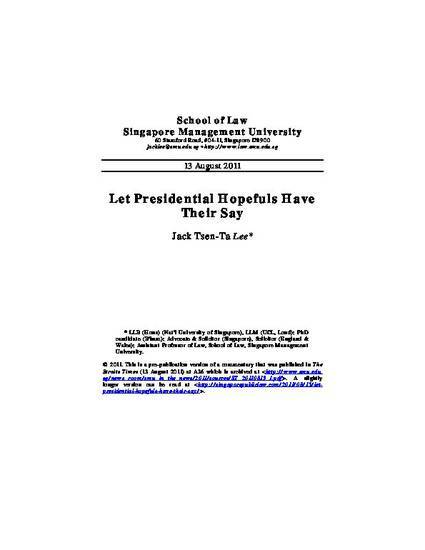 The announcement by the Presidential Elections Committee (PEC) of the prospective candidates who have been issued certificates of eligibility for the 2011 presidential election in Singapore makes interesting reading for what it does and does not say. The Committee’s decision-making process is also fairly opaque. It is submitted the rules governing the PEC’s task should be reviewed before the next election. At least, it is hoped future Committees will adopt as constitutional conventions the practices of granting hearings to applicants, announcing decisions well ahead of nomination day, and issuing full reasons.